Hey, Vsauce, Vulbjorn here. Now that I got my steam account fixed (by simply making new one), here's little atelier of my infested trashgoblins for your eyeball viewing pleasure. No WiPs. Apparently puush wipes out oldest screenshots, so I cannot find anything anymore. Hey, Vsauce, Vulbjorn here. 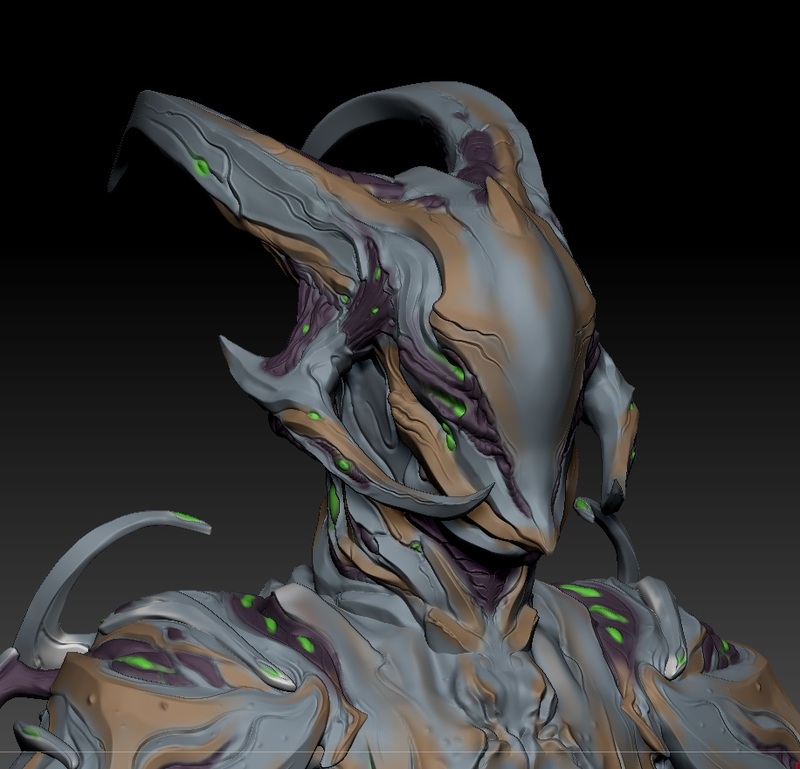 Due to some recent banking issues with Steam, it seems like I'll need to skip this Tennogen round until I fix them (as Steam won't let me post anything until I do). 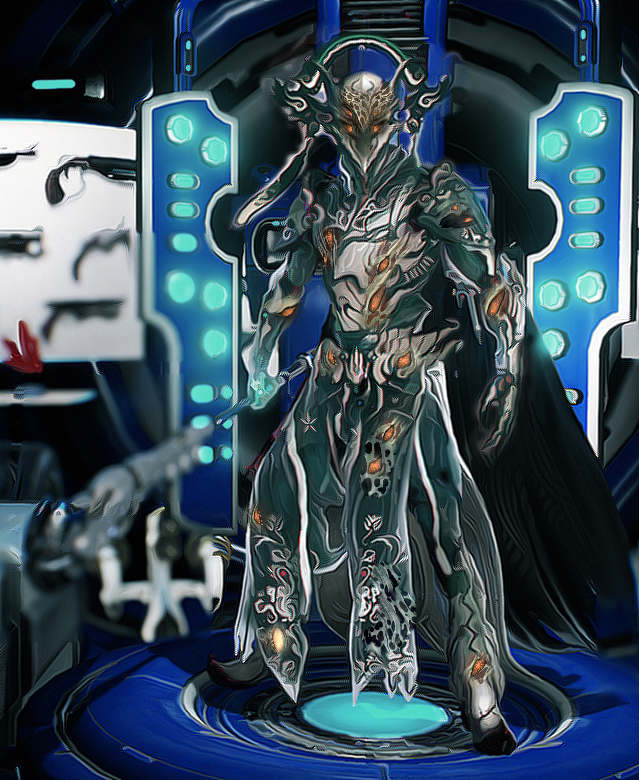 However, I still would like to show my Oberon, as he was fully completed until I hit this wall. Here's some shots and colour scheme presentations. 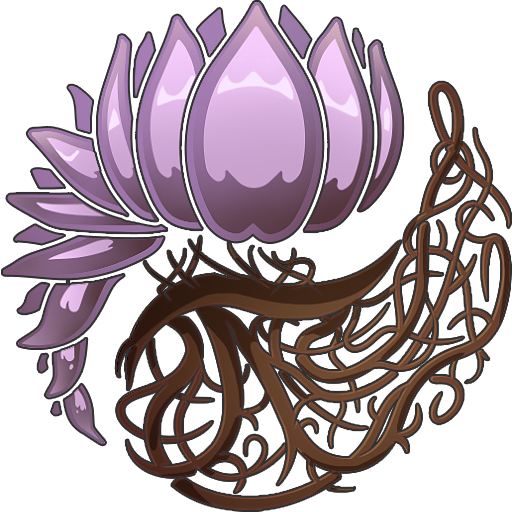 I also wonder, now that I have somewhat indefinite amount of time until I fix my issue with Steam (if I ever be able to do), what would you like me to make? I generally dont like infested stuff but this and your Carniflex skin are definetly an approach to infestation I love ! 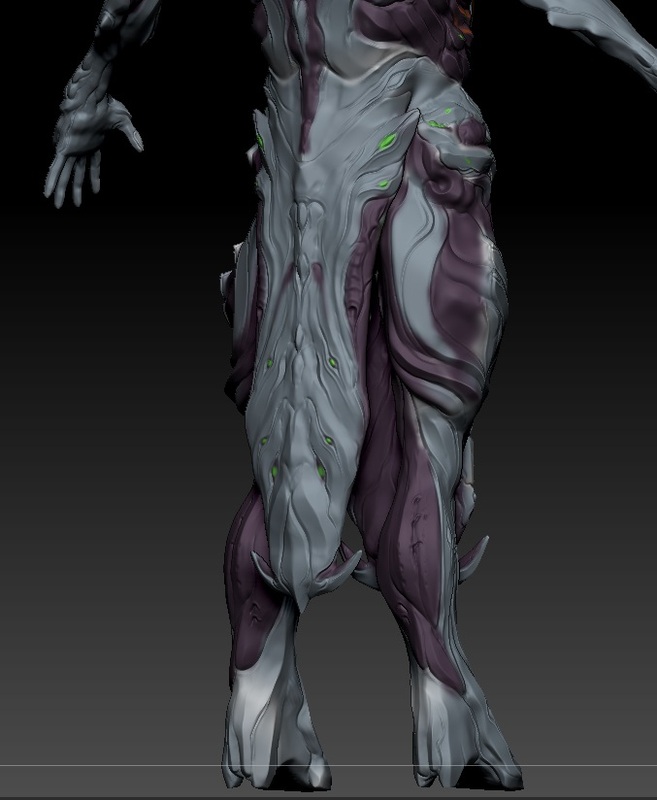 About what I would like to see from you, I would says some warframe that have odd shapes hard to work with with non-infested stuff like Inaros, Nezha or Nidus because your infested style could make them easier to work with while giving amazing skins to some warframes that don't already own one. There are a few good choices. 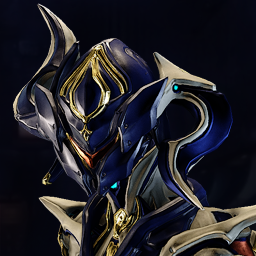 Atlas, Chroma, Excal, Hydroid, Loki, Mirage, Nekros, Ember, and Saryn would probably be the best out of all frames. 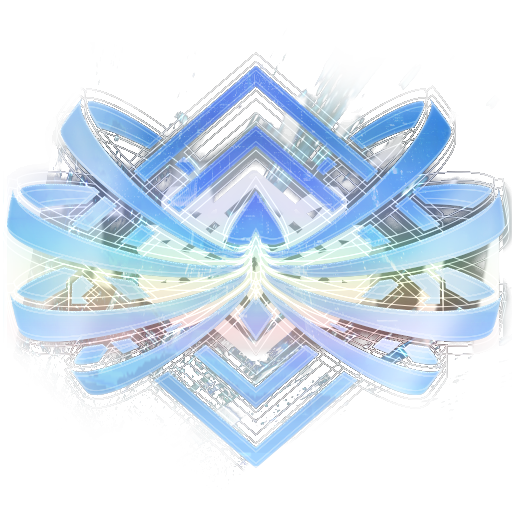 If I had to narrow it down I'd say Nekros, Mirage, and Saryn would be the next ones I'd like to see in no particular order. Oh, I didn't give my opinion of the Oberon. My bad. It looks fantastic! Wish you were able to submit it. I have to wonder how the helmet looks on Feyarch though. This looks fantastic! Really like your take on the infested style. Very clean sculpt as well. 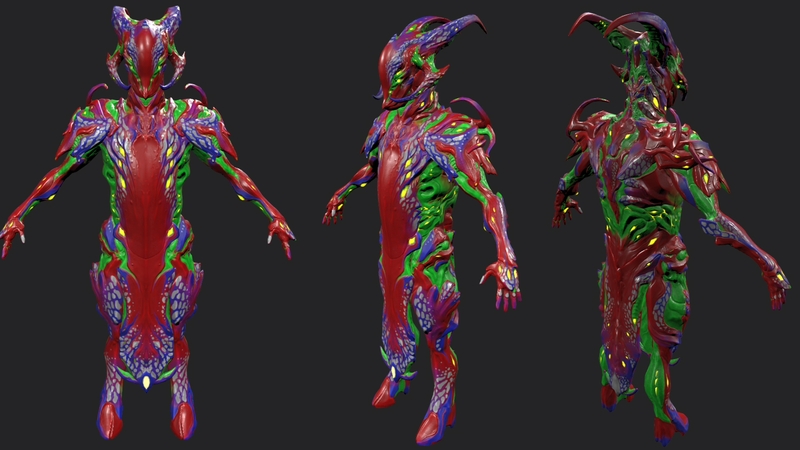 I'm doing some similar dappling/spotted stuff with the tints on my infested Nezha skin. That's a great idea Rekkou! Should totally do that. It'd be a shame to miss the halloween round. Oh man, this looks sooo good! I see a new line similar to the Graxx series being born. 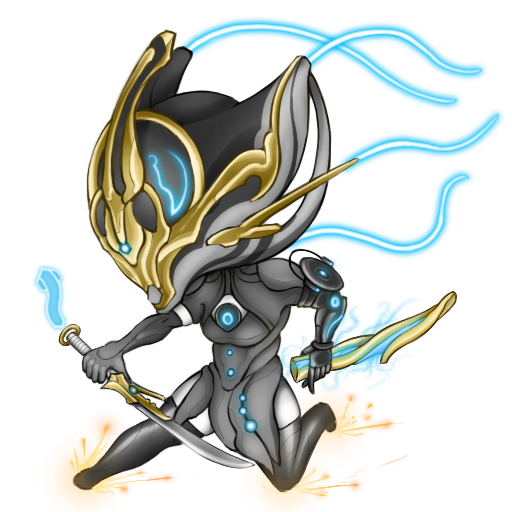 EDIT: What to make, how about a skin for Nidus.... i kid... how about Nekros? He would look great with your scheme. I love your Infested line, snapped up Nyx Carnifex as soon as I could. Would love to see what you can do with Trinity. But whatever frame you choose to work on next, I'm sure it'll be great. I wonder if there's any metallic tint? 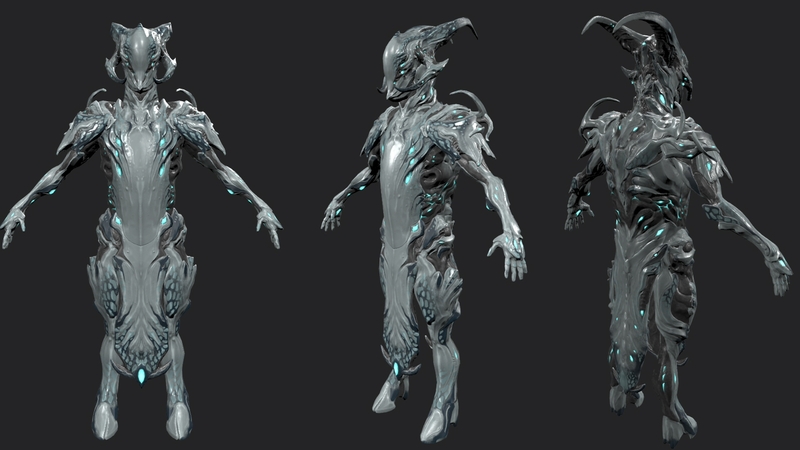 I know it's kinda infested themed, but with Oberon Prime is now here I kinda like to have consistency with tinting. Yay! Finally you're here! Like your work very much, keep on going tho! Don't add any metallic tints onto the organic looking, KEEP the infested appearance all the time! Hey, thanks for liking my flaming garbage, everybody. 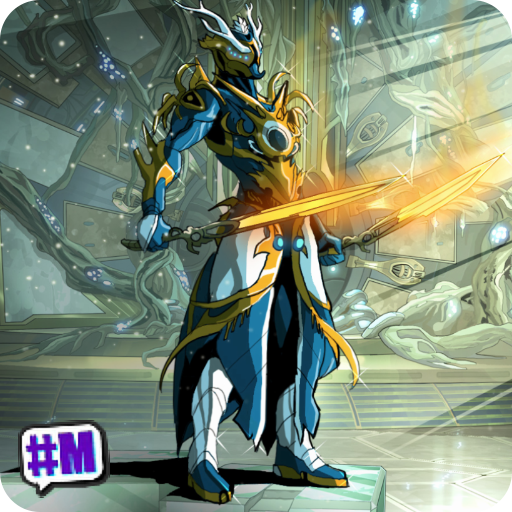 @Vlada91 I'm not sure I will ever make an Excalibur skin, to be honest. He already has like twenty thousand millions of them. 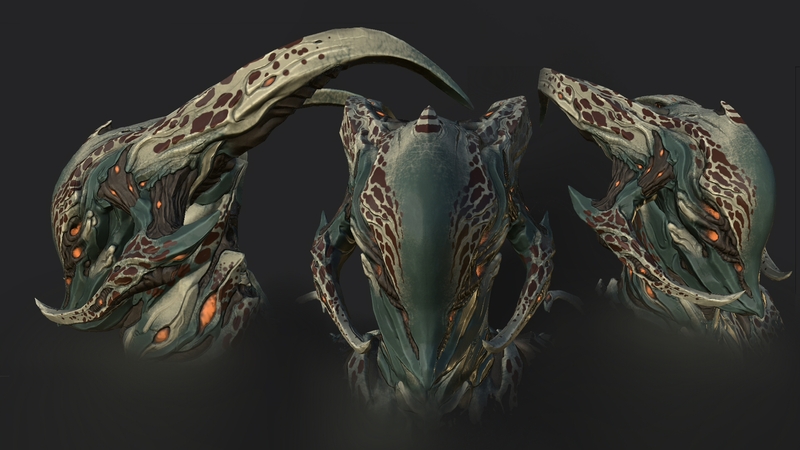 I am, however, interested in making an infested Harrow skin, I think it will look very interesting. @Shadilay I probably won't make a Wukong skin any time soon simply because I kinda dislike Wukong, don't play him, and his mesh is also very mechanical looking. I won't be able to make Wukong not Wukong looking, kinda the same way Faven had issues with not being able to make Mesa into not-Mesa. @lukinu_u Thanks. Out of these three I'd probably go for Inaros first. He looks very inhuman and it will be very interesting to play with his shapes. 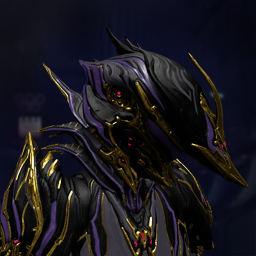 @(Xbox One)Valen Warden I have some plans for infested Saryn. It might sound weird, but I'm planning to give her a mushroom for a head. @Rekkou It's not my bank account that is broken, it's my contact information, and Steam refuses to change it. I can't connect any other bank either because it has to have the same name as one that is stated in contact info (which is outright wrong), so I'm stuck for now. Will, probably, eventually resolve. 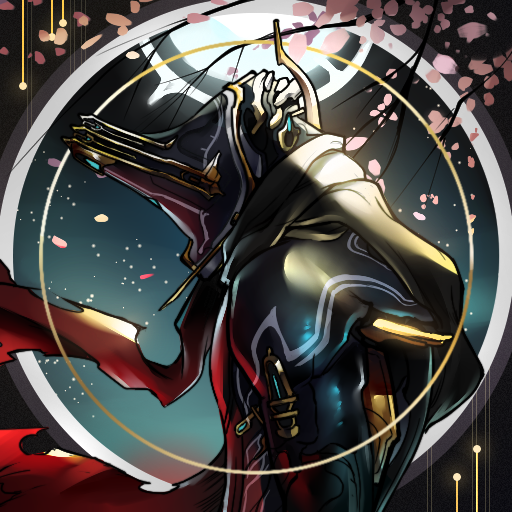 If not, will just make new account, specifically for tennogen, but it's also not optimal and I try to avoid doing it for now. It's kinda a super annoying situation which I also don't have a whole lot of control over. @LogaMC1995 No, there's no metallic tints. I experimented with metals at some point, but came to conclusion that they don't fit and really, I was trying to stick them in only because people were asking for them. I removed metals on my Carnifex and replaced them with one more tint instead. And thanks to everybody else who I didn't quote. 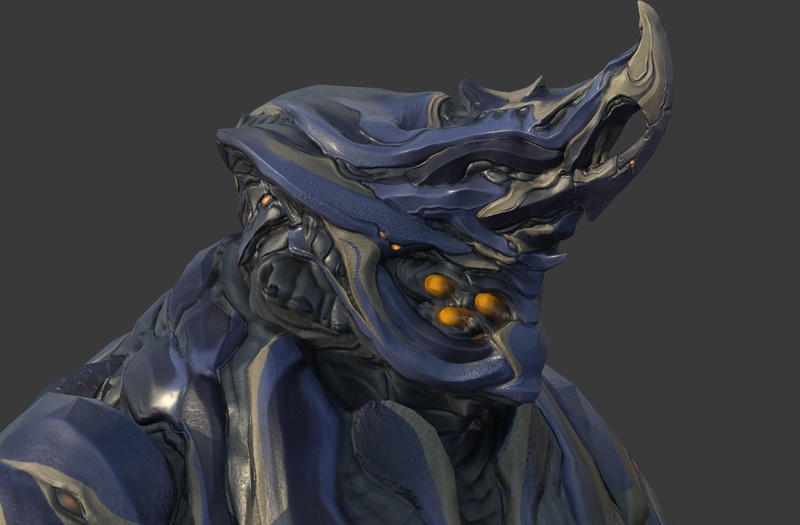 For now, I have started sculpting Rhino's skin, with big ol' tusks. 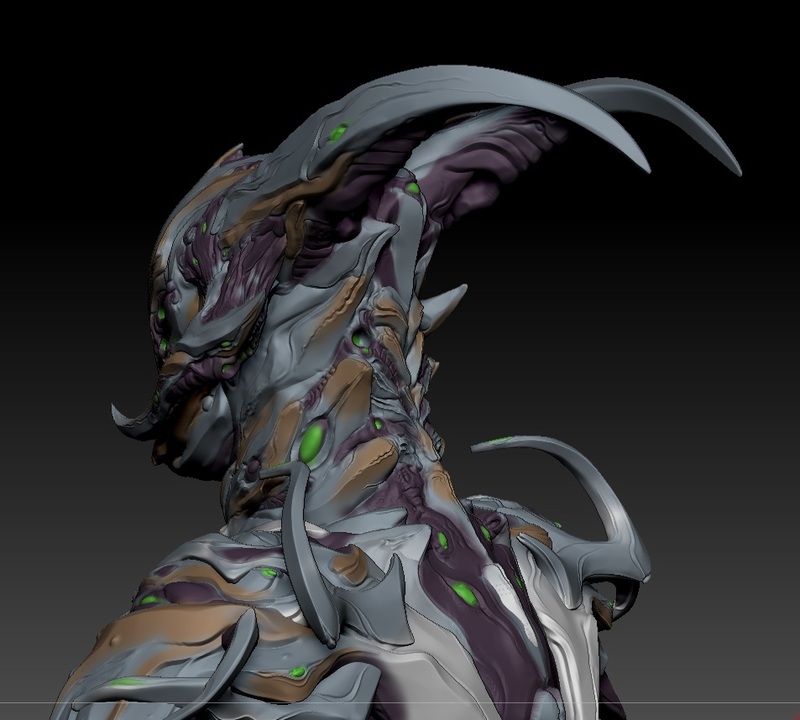 Next one probably will be either Inaros ( I am suddenly very interested in working with him) or Saryn, who I had some concepts for. 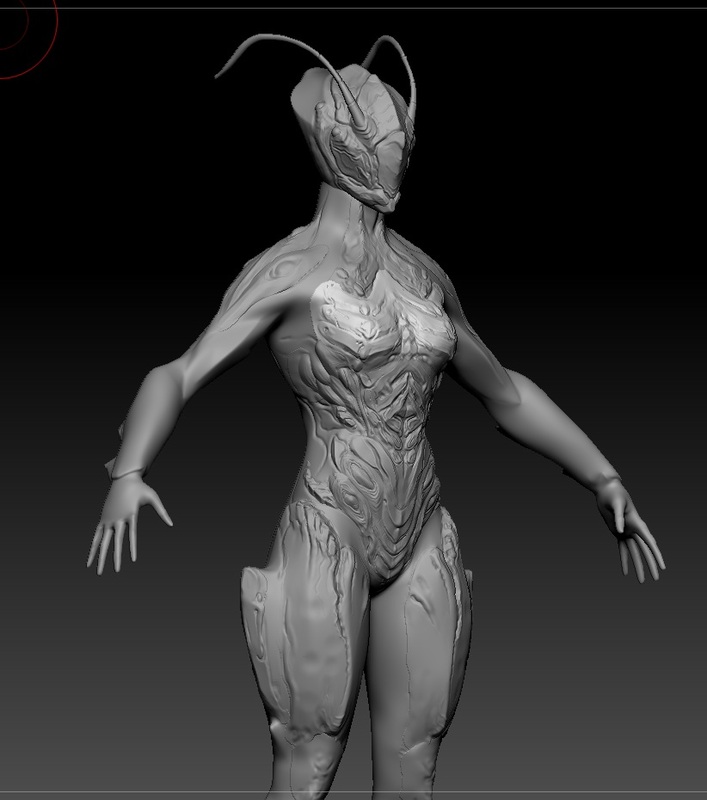 I have some plans for infested Saryn. It might sound weird, but I'm planning to give her a mushroom for a head. That doesn't sound weird at all. When you think of mushrooms, you just think of the generic stem with a bloom of flesh, but there are some beautiful and very, actually, infested looking mushroom varieties. No, there's no metallic tints. I experimented with metals at some point, but came to conclusion that they don't fit and really, I was trying to stick them in only because people were asking for them. I removed metals on my Carnifex and replaced them with one more tint instead. Thanks for replying. It makes sense to have no metallic tint with infested themed skins. 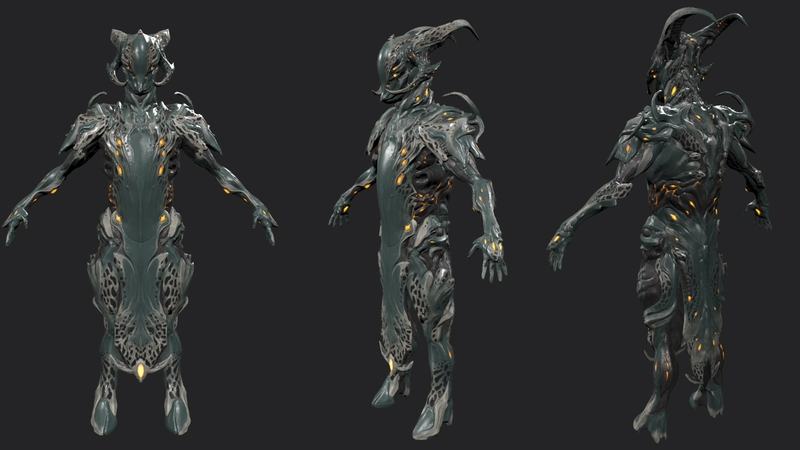 Anyway, I like the idea of sorta-infested Oberon skin. +1 from me. @Vulbjorn Whatever you do DO NOT FOLLOW that vlada guy's idea. It's not even his idea, he just photoshopped it from Ignus Dei's personal concept art. You'll get into trouble if you try making similar design. @Rekkou Don't worry, I won't use it. I recognized the art, plus I always make my own concepts. But I appreciate the ideas nonetheless. Don't worry, I won't use it. I recognized the art, plus I always make my own concepts. But I appreciate the ideas nonetheless. Good to know, you have unique style that will bring more variety to the table. It's a waste if you ended up becoming a proxy for other people's idea. 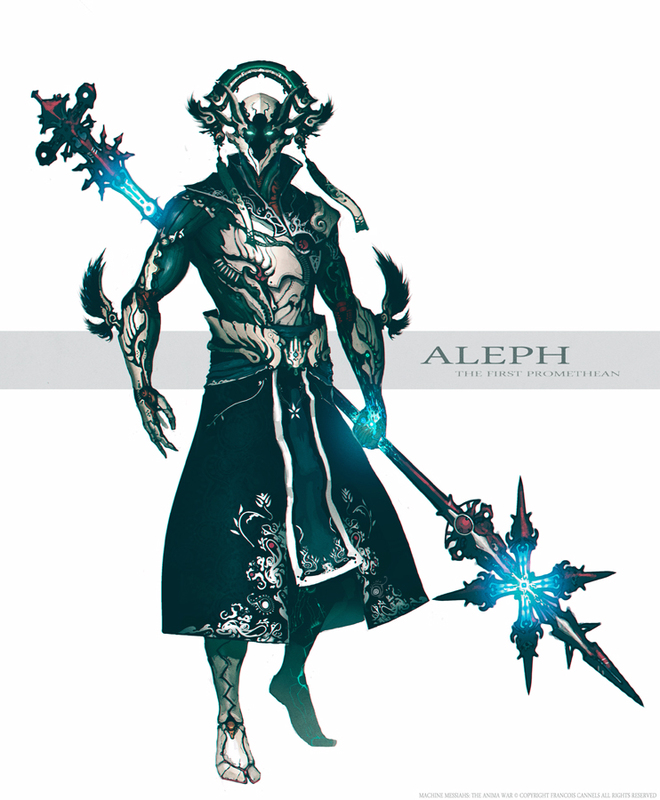 Well if you do make a harrow skin... plez add a hood! So, I spontaneously started working today on a Rhino skin. Here's very early WiP, if someone is interested enough to lay their eyeballs on this trashclown's work. 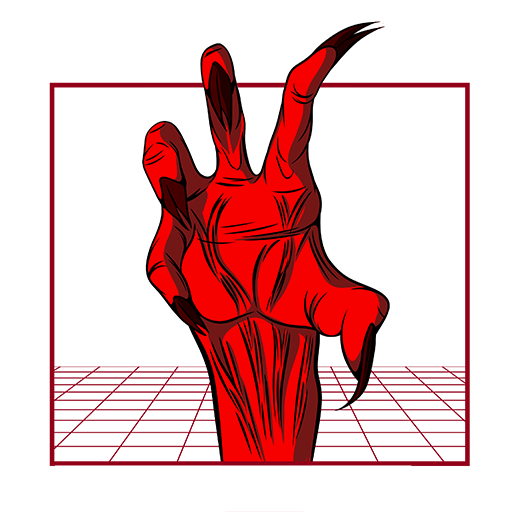 Of course, I'd like to point out that I'm still in early design phase and everything is subject to change. Plus despite having some paint, it doesn't have textures.